When to Use a Bull Call Spread with a Naked Short Put Option? What is the Risk of a Bull Call Spread with a Naked Short Put? In this example we are looking at a July silver chart. We have already identified two things. For one; the market is in an uptrend (duh) and even more importantly; it is going up in a recognizable Fibonacci pattern. However, on closer inspection we see that the daily swings from high to low are in the thousand dollar plus range per position. In fact, the price of silver had recently dropped a dollar (a $5,000 profit or loss for anyone holding a futures contract) in a matter of days. You can see that the market was experiencing extreme volatility on a daily basis. In other words, the waves are great for surfing but the water is full of sharks. Although a pattern has been identified and it seems as though this is an opportune time to jump in, a long futures contract would require an extremely deep stop loss. In fact, a trader would have to place a sell stop about 40 cents below the current price in order to give himself a chance to survive the daily market swings. This is a risk of $2000 in a market in which we are seeing 40 cent moves in relatively short periods of time…the probabilities of being profitable in such a venture aren't promising. Due to the extreme uncertainty in the marketplace and the inherent risks of trading with outright futures contracts, this is the perfect opportunity to use an aggressive option spread. In this case it is a bull call spread with a naked leg. According to the information available to us, an opportune structured trade seems to be buying the 875 call and selling the 975 call along with the naked leg, the 775 put option. The naked leg is approximately 90 cents below the underlying futures price at the time giving the trade plenty of room for error. 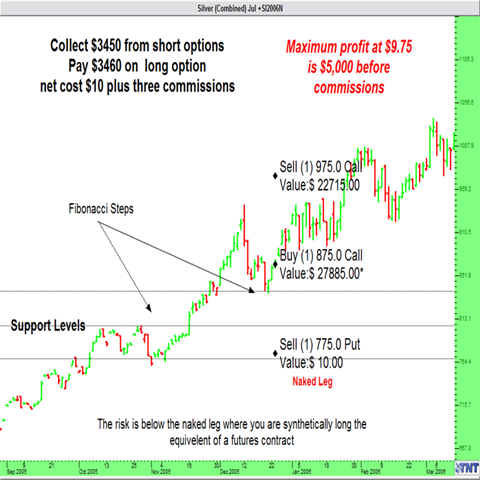 Below the strike price of the short put, the trader becomes exposed to unlimited risk and a position that is similar in nature to a futures contract. To illustrate the differences in, selling this put is actually $4500 ($50 x 90 cents) less risky intrinsically that simply going long a futures contract. This assumption is based on the fact that a futures contract is immediately responsible for losses with every tick that the futures price goes down, a short put option at expiration is only responsible for the amount that the futures price is below the strike price of the short put. Even more convincing, once the futures price reaches the strike price of the short put the delta value is approximately .50 or half of a futures contract. Thus you may not experience the wild hair raising, white knuckled fear that one might encounter trading silver futures in today’s markets. Based on theoretical values supplied by Black and Scholes models, the total out of pocket expense of the trade would be about $10 before commissions and fees. This number is derived from the net premiums, the amount of premium paid for the long option minus amount of premium collected for the short options. The maximum profit of $4870, ($5000 intrinsic payout, minus $10 premium paid, minus $120 in commission paid on 3 legs at a $40 rate) on the trade occurs above 975 at expiration. The breakeven point of the trade, before transaction costs, would be $10, or just 1/5th of a cent above the long call strike, 875. Between the long call and the short call, the risk is limited to the premium paid ($10) plus commission. As with anything else in life, trading this way comes with opportunity costs. If there is a substantial swing in favor of the trade the value of the position will increase at a slower pace than a long futures contract would enjoy. Additionally, the short call option not only limits the profit potential at expiration but at any time before expiration it may actually cut into profits experienced on the long call in the form of increased premium values due to volatility and demand factors. Now let’s take an objective look at the odds involved in this trade. The position involves one long option and two short. It has been said that more options than not will expire worthless and there are several studies that suggest that this is the case. This spread involves two short options and one long...two out of three isn't bad.